If you want to learn what the best workout split is to build muscle… Then you need to read this article. One of the biggest decisions you have to make when starting out in the gym is choosing what workout split (or “workout schedule”) you’re going to use. Or in other words, simply figuring out how you’re going to schedule your exercises throughout the week. For example, when I first started going to the gym I used what was popularized in fitness magazines and what everyone at the gym seemed to be doing; the bro-split. But looking back with the knowledge I now have, it begs the question as to whether or not I would have progressed noticeably faster had I used a different or “better” workout schedule than the bro-split. And honestly, I think there’s a good chance I would have. As for what I would have done instead and recommend you do as well, let’s first take a look at our options. One popular option is to train certain groups of muscles together during each science based workout. And with the total body workout split, you train all of your muscles during each workout mainly through the use of compound exercises. Now the previously mentioned workout splits are likely superior to the bro-split for a variety of reasons. The main reason though has to do with muscle training frequency. 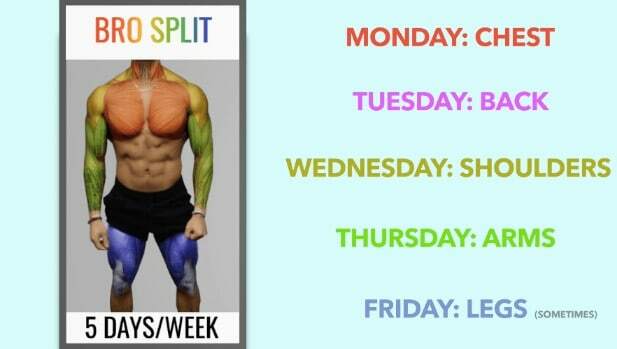 Training each muscle at least 2x/week results in significantly greater muscle growth than training each muscle just once per week as you do in a bro-split. Subjects training at a higher frequency grew on average 38% faster than those training at a lower frequency. And a similar result was found for upper body strength gains as well. Higher training frequencies not only being able to better optimize the protein synthesis response throughout the week. Higher training frequencies enable you to perform more higher quality sets. What do I mean by “higher quality sets”? Well, for example, let’s say you do 16 sets of chest per week with 4 exercises using a bro-split. During this workout you would start to fatigue after your first exercise, causing your performance and resulting work output to decrease from then on. Not only that, but you’d also likely achieve a greater work output (sets x reps x load) since you’re not doing as much volume all at once and can thus exert more effort during each set. But now moving forward, as for which of these “higher training frequency” splits is best for you, it depends on a variety of factors but mainly on your training experience. 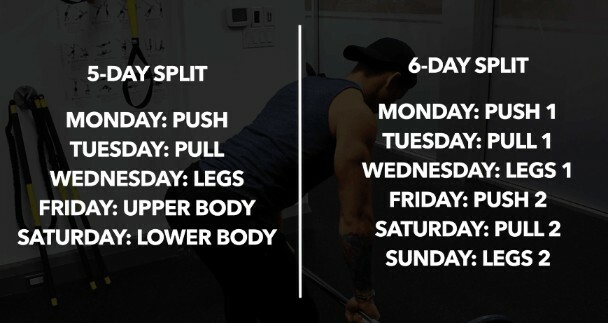 If you’re a beginner and just getting started in the gym, then I’d recommend the full body workout split two to three times per week. 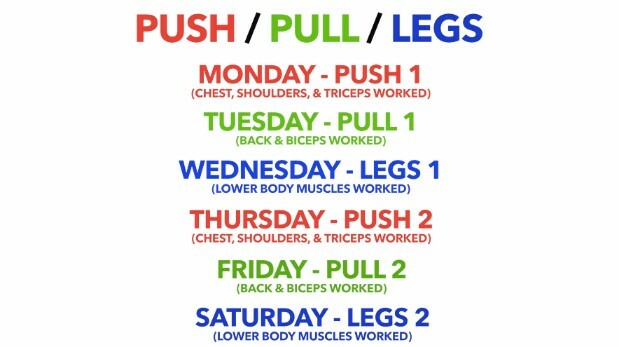 And within each workout you use mainly compound exercises to hit every muscle. And since a full body training split enables you to perform compound movements more frequently when compared to other splits, you’re able to master them more effectively and build a solid base of strength faster than you would otherwise. …but it also reduced their rate of perceived exertion. Meaning that they felt their workouts were easier and they were able to recover faster, despite actually performing the same amount of volume as the lower frequency group. Which is a major bonus as a beginner since you’re more prone to muscle damage, fatigue, and soreness from your workouts. Despite the various benefits of full body workouts, given the positive relationship between volume and muscle growth, as you gain more experience you’re inevitably going to have to increase volume in order to further progress at the optimal rate. And although you could simply continue increasing the volume of your full body workouts…. There will come a point where your workouts just become too long and fatiguing to complete. Once we go above a certain threshold of workout volume, splitting it into separate workouts throughout the week should produce greater muscle growth than performing it all in a single workout. Hence why I’d recommend that once your progress stalls with the full body split, switch to a 4 day workout split like the upper/lower split or something similar such that you have more training days to fit in extra volume. This will just once again enable you to fit in extra volume as needed to continue progressing without causing your workouts to be excessively long. But as you can see, although some routines have various advantages over others, there really isn’t one “best workout split”. Your training routine should simply be viewed as a tool to organize your workout volume in a way that is most enjoyable and practical for you. Whether it’s with a bro-split like I started out with, one of the alternatives I mentioned, or something completely different. Just know that workout volume and consistency are the more important factors, so focus on those two variables and you will see positive results regardless of the split you use. …And if you’re looking for a step-by-step program that shows you how to optimize both your training AND nutrition in order to progress as efficiently as possible… Then simply take my starting-point analysis tool here to find which program is best for you. That’s it for this article – hope you enjoyed it and found it useful! Don’t forget to give me a follow and connect with me on Instagram, Facebook, and Youtube as well. Cheers!